Here the problem isn’t catching a fish, it’s catching the right fish. By watching your bait, and keeping it away from the immature and illegal bass (and the illegal garibaldi), you hope to limit your catch to the halfmoon. After 20 minutes two large opaleye appear, each in the two-to three-pound range. Now, you open your package of frozen peas, bait one of your hooks with the peas, and move your bait up to a mid-water depth. The halfmoon are attracted by the squid, the opaleye by the peas; both seem excited by the presence of the other. 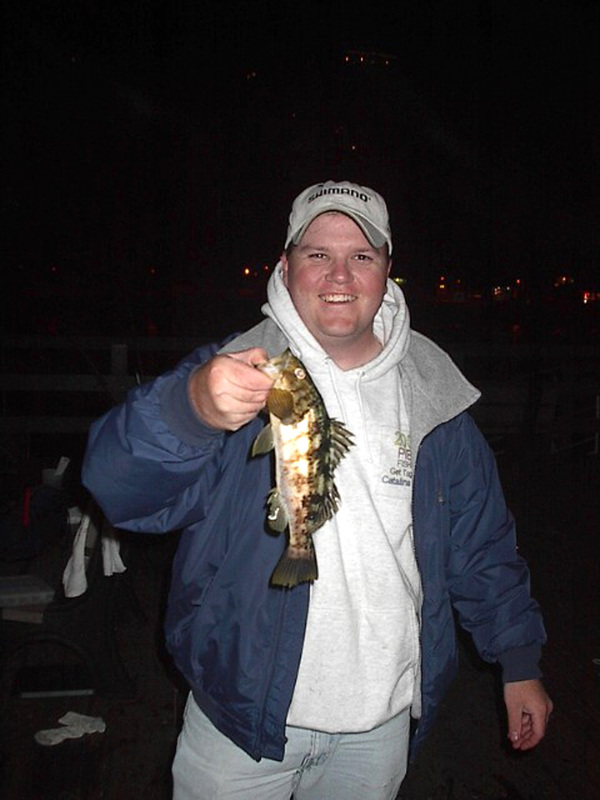 Soon you have caught two halfmoon and an opaleye, but it is getting harder and harder to keep the bass off your hook. You finally switch to peas by themselves, action slows, and it is a wait-and-see game, and you can see the game. Does it sound interesting? It is! 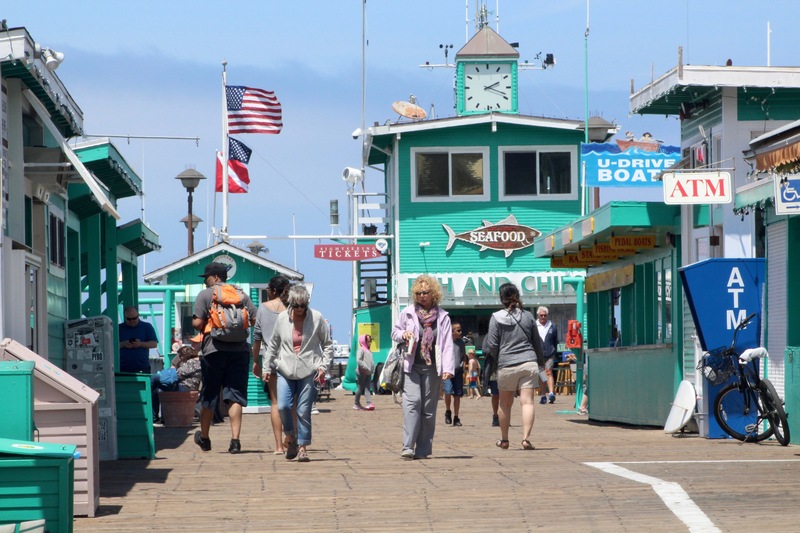 However, most anglers who visit Avalon will never sample the pier action. It is simply too close to excellent boat fishing and scuba diving. Why settle for small game when you are so close to the bigger action? Well, it is ideal for youngsters, you don’t have to worry about seasickness, and it has a charm all of its own. You may, of course, catch one of the bigger fish that roam these waters but as a rule small game is the main game. Environment — The pier juts out from the small, fairly narrow Crescent Beach in Avalon Harbor. The bay bottom here is both sand and rock with seaweed and other unknown obstructions providing cover for the fish. The depth around the pier is fairly shallow but the bay itself slopes quickly into deeper depths reaching nearly a hundred feet midway between the Mole and the Casino. 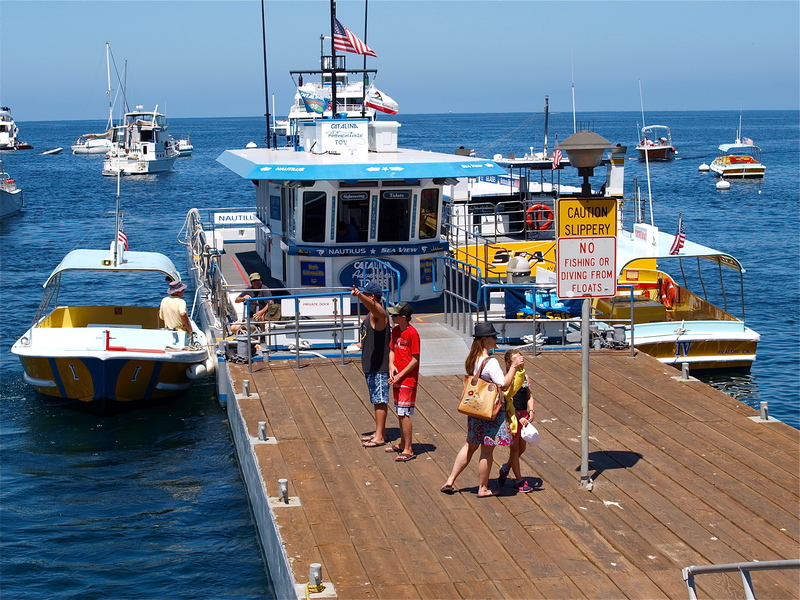 Remember, Catalina is an island and the Catalina Channel that separates the island from the mainland is over 3,000 feet deep (and over 5,000 feet deep in a couple of canyons off the southeast tip of the island). Within rowing distance of the pier is water hundreds of feet deep. 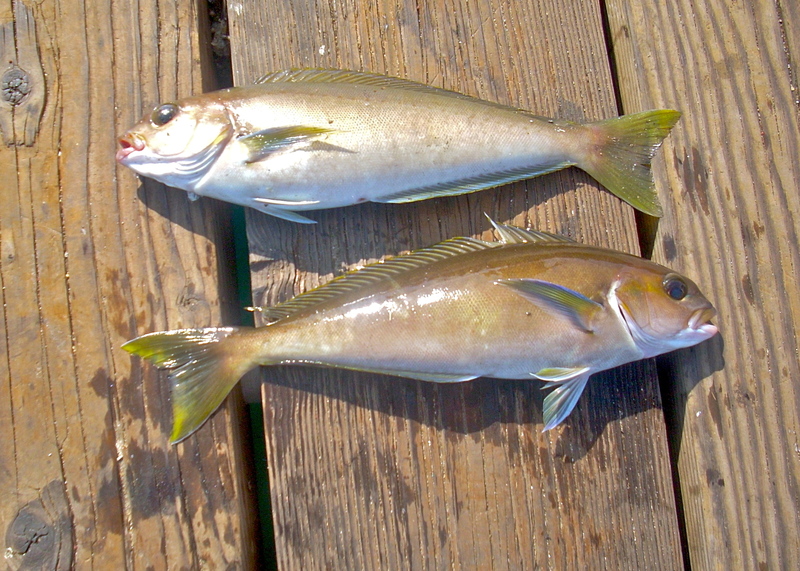 Because of location and environment, the pier is one of the best to catch several SoCal species that are fairly uncommon to mainland piers—halfmoon (Catalina blue perch), opaleye, senorita, rock wrasse, blacksmith, garibaldi (a beautiful fish protected by the state for many years), and California sheephead. Less common but a possibility are ocean whitefish (Caulolatilus princeps). Unfortunately the actual space available for angling has decreased dramatically over the past few years. When I first visited the pier in the ‘60s almost the entire side of the pier was open for angling and it remained that way for many, many years. Now angling space has been lost due to buildings and floating docks reserved for craft of various design (glass bottom boats, submarines, etc.). In addition, a plethora of ropes hang from the end and sides to the various docks. 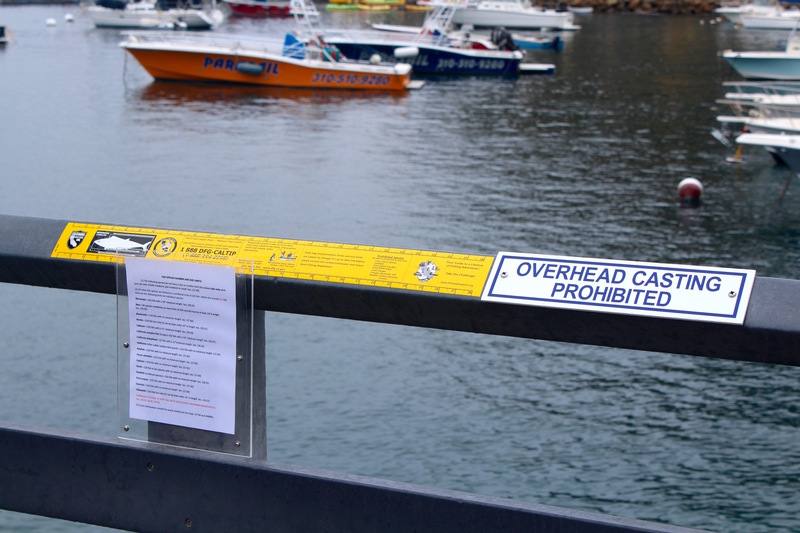 Anglers for the most part are only presented a few feet of space out at the end of the pier and even there the ropes crisscrossing the water can be hazardous. During the winter, when the outer dock is moved, and some of the tourist boats are moved, more space is available. From Easter Week well into the fall, space is at a premium. At most about a half dozen anglers can fit in at the end section and even then you have to be very careful to avoid tangling your line. A dock is added to the front of the pier each summer season. 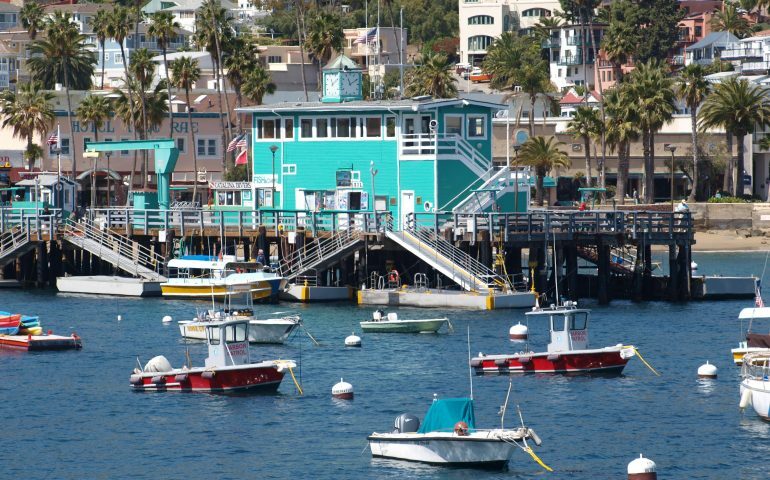 Catalina, the Magic Isle, and Avalon, have been destination spots since the late 1800s and it’s more popular than ever. Avalon itself only has about 4,000 year-round residents but the Chamber of Commerce has done its job well. The result is that over a million people a year crowd Avalon’s streets and the small town can be crowded most days from spring until the fall, especially during weekends. 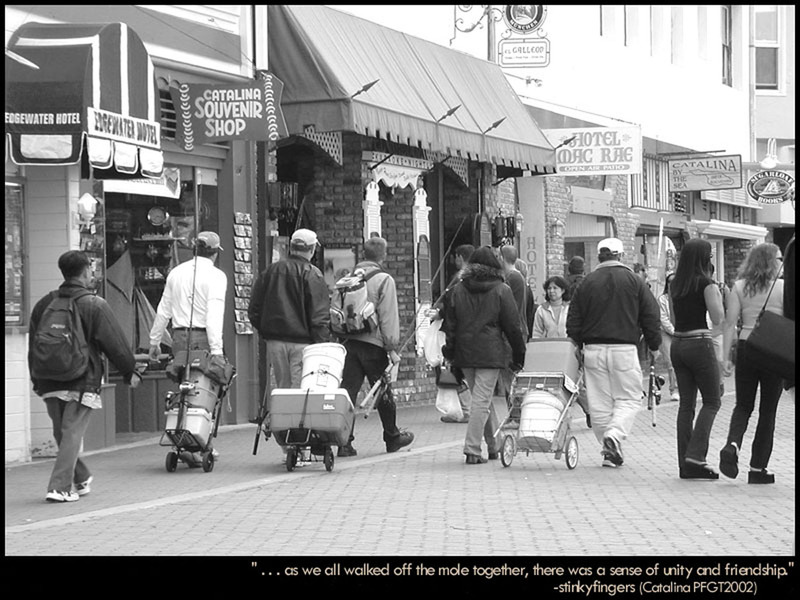 Restaurants can be crowded, stores can be crowded, the sidewalks are crowded, the bay is crowded (with yachts), and the pier is crowded. 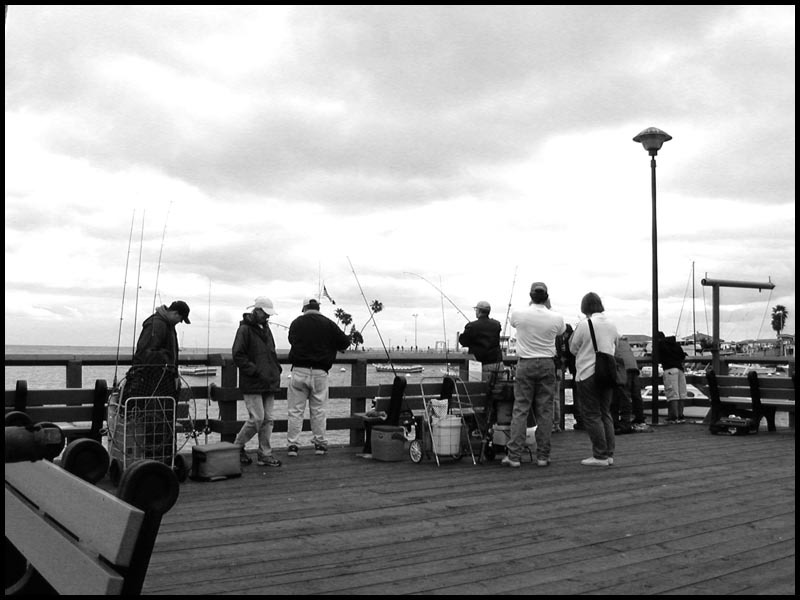 And, given all those fish that are seen in the waters at the end of the pier, a lot of people rent tackle and head out to the end of the pier to catch some fish. It can, at times, be too crowded. Sometimes it’s better to simply leave the pier to the crowds (mostly youngsters) and head out to the Mole. Such is progress. Come back at night and you may have the pier to yourself. Fish — This pier, as well as the nearby Cabrillo Mole, was the setting for the first “Pier Fishing in California Pier Rat Get Together.” It took place in April of 2002 and attracted an eminent group of dedicated, enthusiastic and intelligent pier anglers from the web site (pierfishing.com). Coming from a plethora of California cities stretching from San Francisco to San Diego, people had a chance to fish together, socialize and put the faces to the names they had seen on the PFIC Message Board. It was one of the most enjoyable experiencing of my pier-fishing career and led me to designate Avalon as my personal Brigadoon (or perhaps El Dorado), and to give the nod to this small pier as my favorite pier. The gemutlich (warm and congenial) fellowship shared by the pier rats during the limited time we had together provided frabjous (better than fabulous) memories that will last a lifetime. 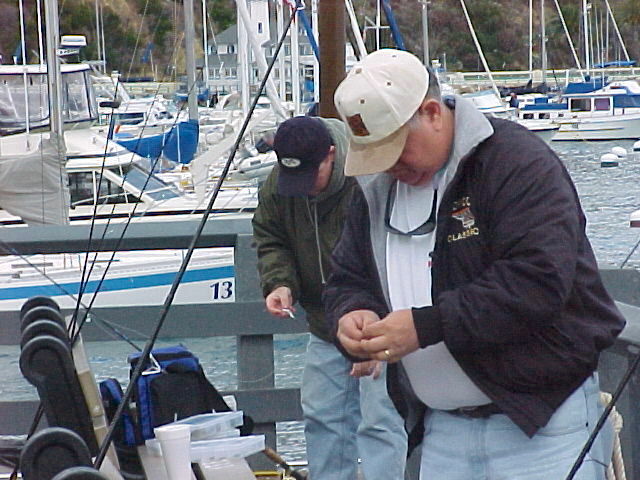 The Get-Togethers continued and even expanded as United Pier and Shore Anglers of California became a joint sponsor. People came from as far away as Louisiana, and the group’s size continually grew until the 2010s when a combination of Catalina price increases and a slow economy saw a dip in attendance; the decrease led to 2015 being the last gathering. 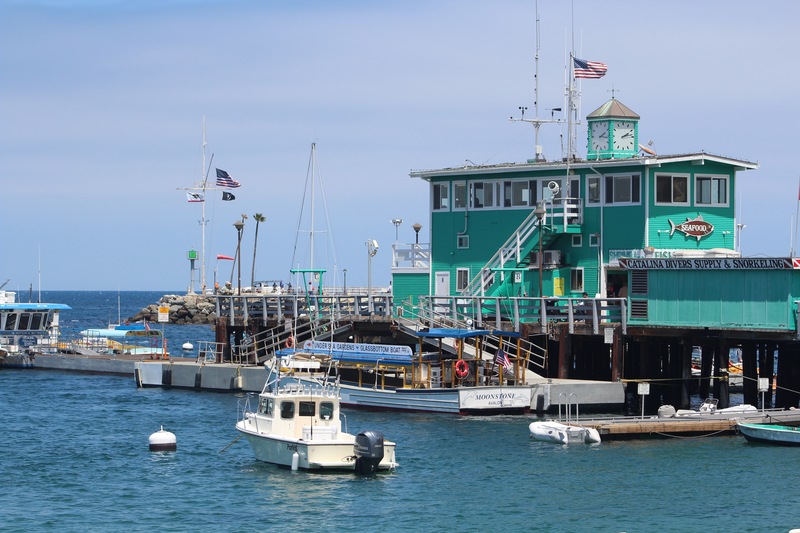 What I saw at the gatherings encouraged me to make even more visits to Catalina and the visits, at various times of the year, have provided some statistics for the Green Pleasure Pier (GPP) that are pretty interesting. The stats: through 2017, I’ve made 54 trips to the pier and caught neatly three thousand fish. The fish per hour average is 12.8 and the points per hour average (that incorporates both number and and quality of fish) is 26.7. Both are the highest averages for any pier in the state. Included in the statistics are a decent variety—21 different species (not counting lobsters, spider (sheep) crabs and octopus that were caught). The fish, in the order they were caught: kelp bass, halfmoon, rock wrasse, senorita, shinerperch, opaleye, Pacific mackerel, sheephead, jack mackerel, blacksmith, California scorpionfish, Pacific sardine, garibaldi, jacksmelt, ocean whitefish, island surfperch, black seaperch, salema, northern anchovy, sand bass and largemouth blenny. Seen caught by others, or lost, were several additional species including California halibut, Pacific bonito, horn sharks, swell sharks, moray eels, and bat rays. The numbers of fish are somewhat amazing but it’s because most of the fish are fairly small and they are fairly easy to catch if you know what you are doing. And even those with little clue will normally be able to pull in at least a few fish. Small, generally illegal-size kelp bass (calico bass) are almost inevitably the number one catch on the pier as far as numbers. Unfortunately you will catch 20 undersized fish to every one that approaches or exceeds the 14-inch minimum size (although larger bait yields larger fish). 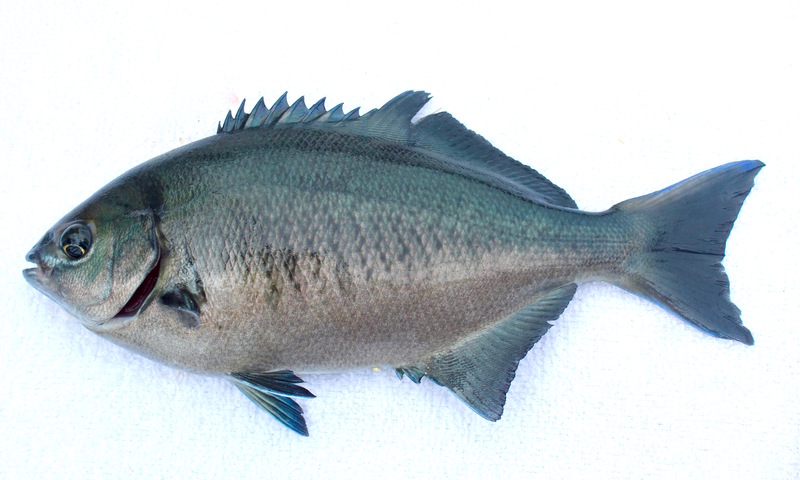 Halfmoon, opaleye, rock wrasse, blacksmith, and sheephead are available on the bottom or in the mid-water level; on top are jacksmelt and jack mackerel. 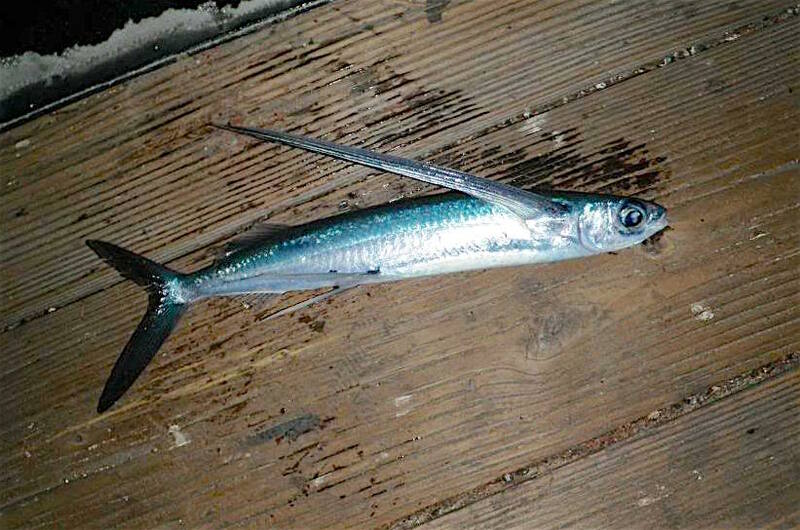 Pacific mackerel, Pacific sardines and Pacific bonito also are found near the top but are not resident species and are only available some years. 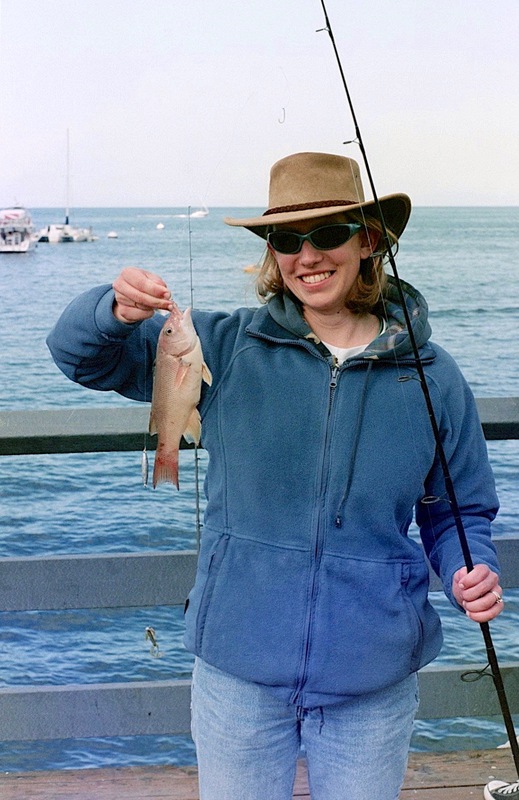 Infrequently an angler will also spot a white seabass or a yellowtail cruising through the water but they’re rarely caught off the pier, they’re more commonly taken from the deeper water of the nearby Mole. Although not as good a spot as the Mole, a few California moray (eels) may also show up. The pier isn’t a great pier for sharays—sharks and rays, but they do show up. Most common are the somewhat strange looking horn sharks with their pig-like snouts and the equally strange swell sharks that can inflate their bodies with air and water until nearly triple in size. Neither is much of a sporting catch but the big ol’ freight train immitatin’ bat rays, aka mud marlins, are another story; a decent-sized battie will give you a fight to remember. 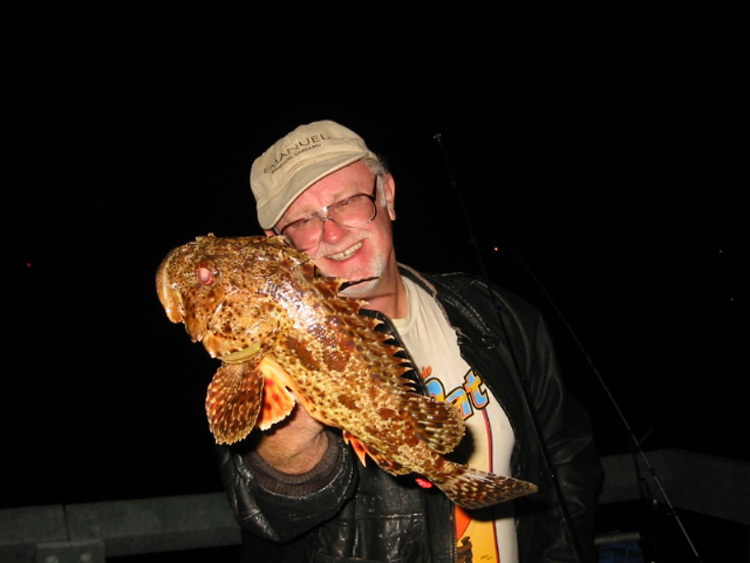 Fishing at night yields most of the sharays but few people make the effort to catch the fish. PFIC member Mahigeer (Hashem Nahid) has provided fish regulations (under plexiglass) to help visitors understand the rules. Fishing Tips — Pretty much anywhere around the end section of pier can yield good fishing but the secret here is to (1) find an open section free of lines and cable and (2) use bait that will get you the species you are after. 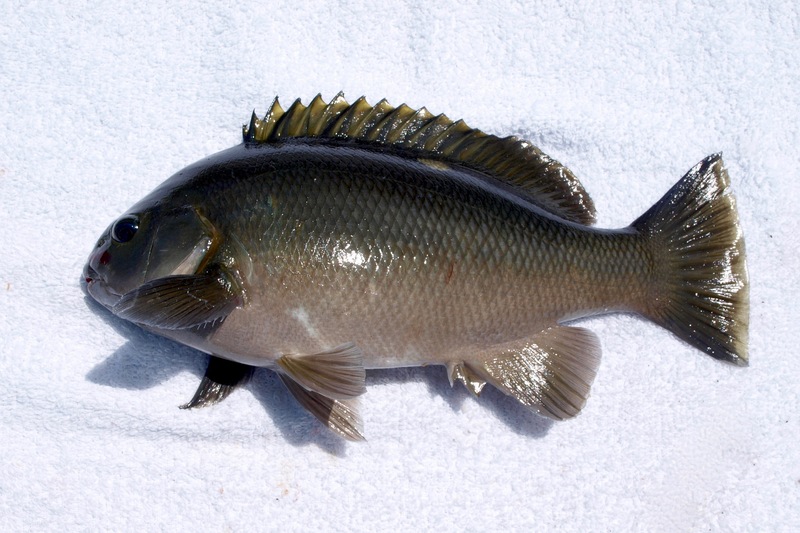 If you’re content with the kelp bass, and they are by far the main fish caught at the pier, almost any bait will work. Pieces of fish work best—anchovy and mackerel, but anchovies, in particular, will quickly be shredded by the smaller fish unless a bass gets it first. Hooks, sizes 8-2, should yield an unending number of small bass while larger hooks (up to 2/0) may keep the various perch and perch-imitating species off your hooks and work for larger bass. Some big bass do hang under the pier but the problem is the ropes and other obstructions. You need to strike quickly and get them out into open water as quickly as possible. Remember their 14-inch minimum size requirement.